They’re Back! with Extra TEASE! Ready to get hot under the collar this festive season? Pop on your glad rags and get ready to be thoroughly entertained by the rising stars who have graduated Bambina Burlesque Academy. These burlesque beauties have sashayed the stage and are back for more. Expect some crowd favorite acts from previous graduate shows, plus some brand spankin’ new ones! End the year with a ba-da-BOOM and a whole lot of razzle dazzle! But wait, there’s more! 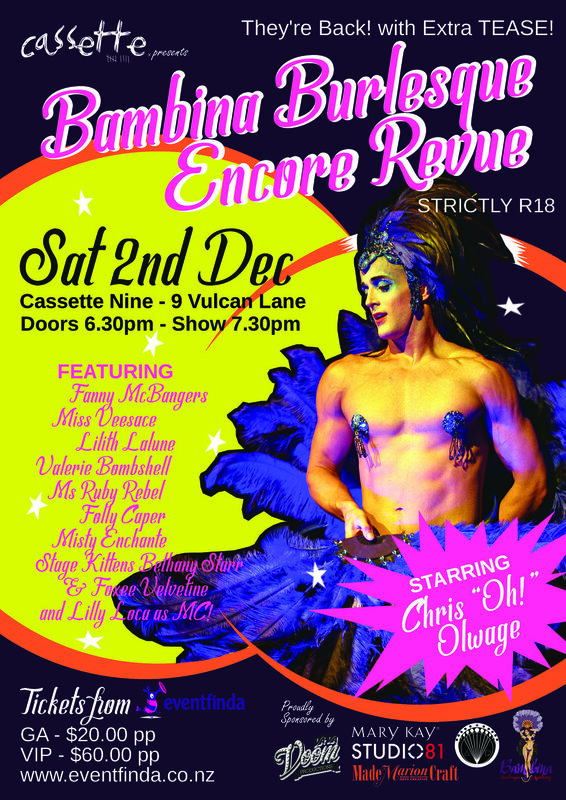 Headlining our showcase is none other than the newly crowned King of the New Zealand Burlesque Festival, Christopher Olwage! Want to be a bit fancy? Be sure to purchase yourself a VIP ticket which includes a seat at either a cabaret table or booth with the best views in the house. To tempt you further, we’ll throw in a house drink or bubbles to wash down your choice of meal from the specially crafted Cassette Nine menu. Oh, and did we mention you also get a gift you can open before christmas? Yes, we’ve got fabulous goody bag treats from our sponsors! Cabaret tables sit 4x people. If you wish to book a table, please buy 4x tickets. There is only 1 VIP booth for sale. The remaining booths are for GA to seat as as they see fit. Dr Sketchy Auckland Presents: Aquaman!